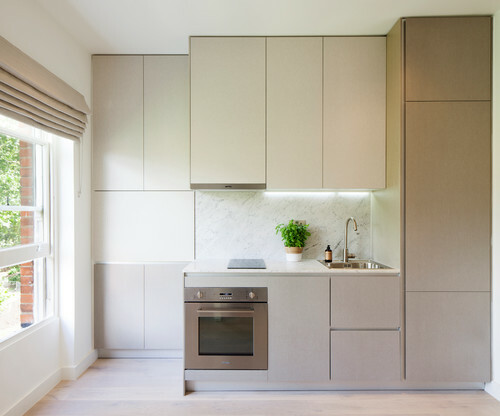 In common with a lot of London-based kitchen suppliers, we are well-practised in designing kitchens for homes where space is in short supply – and therefore extremely valuable. For such homes, it’s essential to plan a kitchen that maximises space, has a functional layout, includes generous storage and, of course, looks great, too. With that in mind, here are 10 tips to help you make the most of your available space – no matter how small it is. First and foremost, before choosing colours, styles and accessories for your kitchen, it's essential to get the layout right. This is true for any size of kitchen, but is especially important when planning a smaller space. By discussing your lifestyle, tastes and everyday routines, your designer can help you decide what you definitely need for your kitchen – and what you don’t. From here they can work with you to develop a functional and efficient workflow. This should accommodate all of your intended uses, and include generous worktop space for prepping and clearing up, as well as suitable and well-placed storage and appliances. If you’ve specified a small area for sitting or dining, then this should be included in the plans, too. 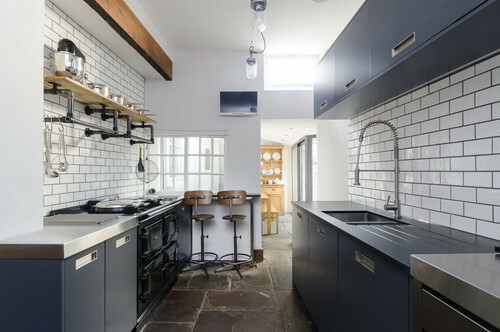 If you don’t get the right layout for both you and the space, then no matter how lovely your new kitchen might look, you will simply never enjoy using it. Colour can have a great effect on how big or small a kitchen looks and feels, so it’s important to choose appropriate shades for your space. 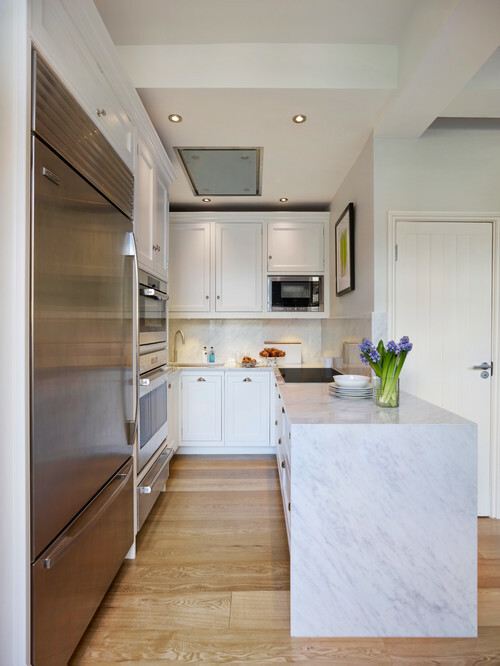 Light colours are typically best for making a small space feel larger and brighter, especially for enclosed kitchens with limited natural light. White is most effective at this, which is why so many of the small kitchens you see online are white. But if a white kitchen doesn’t appeal, there are many other light tones, such as off-white, taupe, cashmere, light blue or pale wood. Each has the same effect in making a space feel clean, fresh and bright. You can keep your colour choices entirely neutral, or add bold accents, whether block or fragmented in a pattern, as these can work well against neutrals without confining the room. If you do want to include dark colours in an enclosed or poorly lit space, then use moody hues below eye level, with light colours above. For example, dark base units and light wall cupboards. It’s worth noting that horizontal surfaces, such as worktops and floors, have the greatest potential to absorb light, so it’s better to avoid dark colours for these surfaces if your aim is to maximise light. 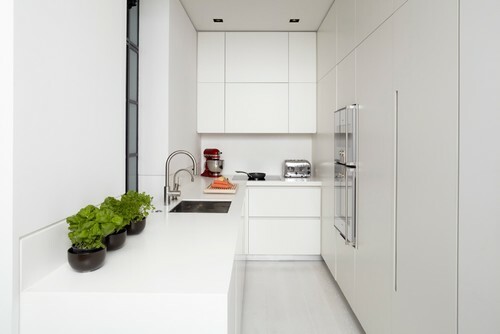 See thousands of white and light kitchens on Houzz to get more ideas. As well as light colours making a kitchen look bigger, glossy surfaces, such as on cupboard doors, also enhance this effect. This is because when light hits them, it’s reflected back across a room and onto other surfaces, creating the feel of a larger space. 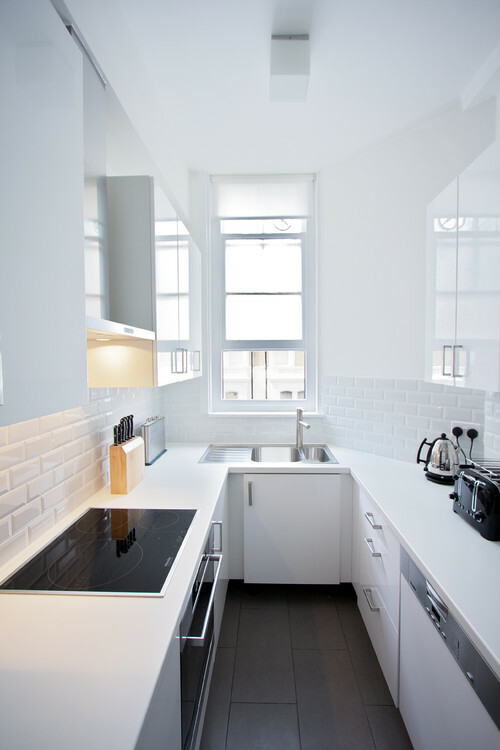 A glass or mirrored surface, such as a splashback, has the same effect. Another option is wall units with glass-fronted doors. These allow the eye to travel through the door to the back of the cabinet, and the extra depth we interpret gives the sense of a larger room. However, for this to work, you can’t overfill your cabinet’s shelves, so it’s perhaps not the best option if you know you’re not the tidiest of people! Natural light is best for creating a clean and bright kitchen look, so be sure to allow in as much as possible, and don’t block windows with wall units or clutter your sills with plants or ornaments. If natural light is lacking, then consider whether it’s possible to add windows, a skylight or even a glazed roof. Of course, natural light works well with the light tones and glossy surfaces already mentioned, but it also makes it easier to introduce darker colour choices, too, such as those pictured here. In a small kitchen where light is focused at one end of the room, it’s often possible to site a small breakfast bar or eating area in this spot, so you can enjoy and make the most of the natural daylight. If your small kitchen is lacking in natural light, don’t panic, as there are plenty of artificial lighting options you can choose from instead. These include natural daylight bulbs, which recreate a similar level of lighting to real daylight. The layering of task, accent and ambient lighting is important for all kitchens. In small spaces, however, it’s essential to get this balance right, as either too many or too few lights can give an impression of a smaller kitchen. Downlights are effective and don’t take up much space, but if you want bigger light fixtures, just make sure they don’t block any natural light. As well as being functional, under-cabinet lighting, as seen here, will create the impression of a larger kitchen simply by drawing the eye’s attention to areas of greater space. Plentiful storage is essential for small kitchens and a lack of it is often one of the biggest frustrations for homeowners. Careful planning is key to getting this right, and should ensure all of your kitchenware has its own designated spot, thus keeping your work surfaces clutter-free. Built-in storage solutions, such as tambour units,larder cupboards, magic corner solutions and plinth drawers, are great for small kitchens. And extra-height cupboards – accessible with a foldaway stool – are useful for storing infrequently used items. Because these reach to the ceiling, they can draw the eye up, giving the impression of a higher ceiling and a bigger space. There are also internal storage options, such as layered pull-out shelves, secret drawers and spice racks, which will help keep you organised. Drawers, rather than cupboards, are a good choice, too, as the contents are clearly visible and easier to lift in and out, though they tend to be more expensive. Slimline units and cupboard doors instead of filler panels are also options to ensure no potential storage space is wasted. And while not hidden, further storage ideas for small kitchens include hooks or magnetic knife or spice racks, which save space elsewhere. 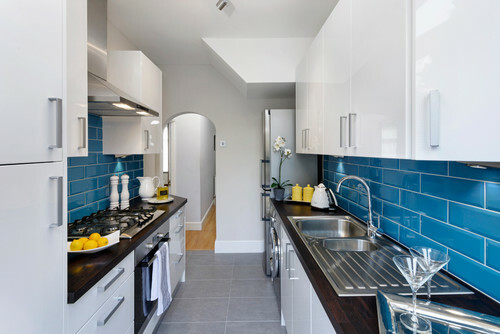 A clever way to free up more space in a small kitchen is to opt for multi-functional appliances. This might be a washer-dryer rather than a separate washing machine and tumble dryer, or a combined microwave oven rather than a separate microwave and oven. This last one also frees up worktop space where a freestanding microwave might otherwise sit. Similarly, a boiling-water tap removes the need for a kettle. Choosing built-in and streamlined appliances with unfussy surfaces, such as an induction hob or canopy hood extractor, can also give the impression of more space. 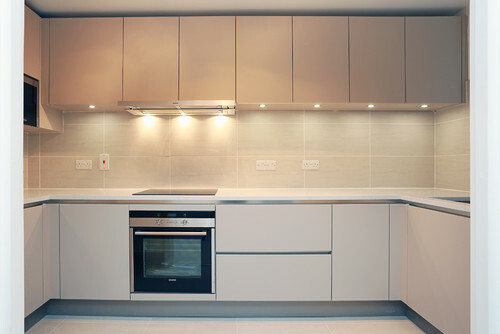 If your kitchen is really small, you could consider smaller appliances, such as a compact oven or dishwasher; these are reduced in size specially for small kitchens. 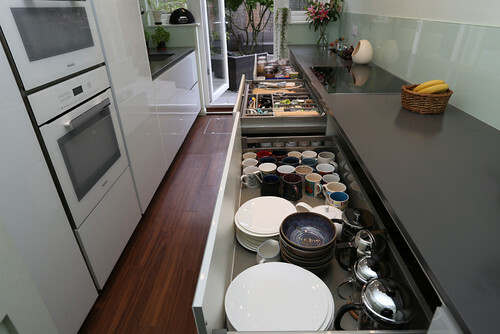 Dishwashers can offer drawer options in place of a standard door, and some oven doors will slide out of sight on opening; this makes them safer for small spaces, as you don’t have to manoeuvre around a hot oven door. 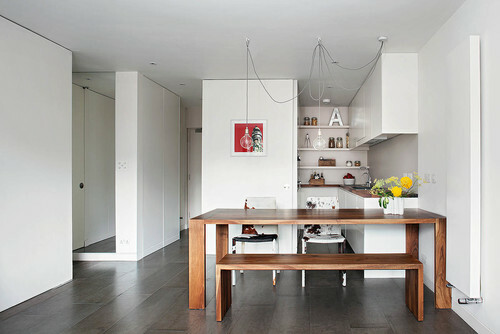 Open shelving can make a great feature in a small kitchen and, of course, it’s functional, too. Doubling up to include two or even three rows of shelves will further increase your kitchen’s storage potential. And in enclosed spaces, open shelving can prove a better choice than wall units, which can sometimes make a kitchen feel smaller because of their weight and size. Open shelves avoid this pitfall as they expand the space. They are extremely useful for larger or bulkier items, such as pots, saucepans or cookbooks, or you can create an elegant display of your glassware and knick-knacks. You might even hang tasteful artwork or mirrors on the wall behind your shelves. Opt for floating shelves rather than ones with bulky brackets to further enhance the sense of space. While open shelves and hooks can prove useful for storage, at the same time be careful not to overfill your kitchen, as nothing will make a room feel smaller than crowding it with household clutter! Too much on your surfaces will also detract from the beauty of your units. If you are a naturally untidy person, factor this in during your planning stage and opt for hidden rather than visible storage. In terms of reducing clutter, it’s advisable to avoid over-elaborate or ‘busy’ detail within the design itself, such as ornamental cornices or decorative handles. Handles can sometimes appear too numerous within a small kitchen design, plus they take up more physical space than might be ideal. This is partly why the handleless style is so popular for small kitchens; handleless doors have smooth, clean lines, giving them a minimal, sophisticated look and enhancing the spatial feel of the kitchen. It may be that a professional can offer advice on reconfiguring your home’s structural layout to enhance the space. This might be an extension to your property, taking a wall down to create an open-plan kitchen and living area, or even removing part of a wall above worktop level to create a breakfast bar. These sorts of changes could allow for a bigger kitchen, or even give you room to incorporate an island or peninsula, with extra storage, expanded worktop space and a seating area. 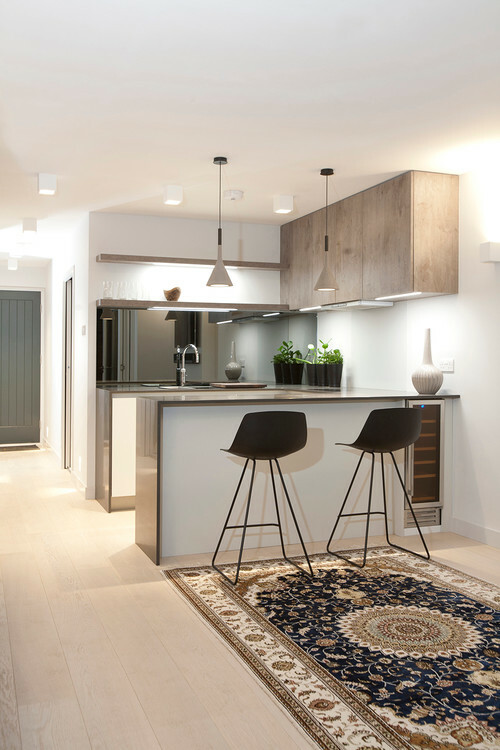 Opening up a space often brings in natural light from a neighbouring room, and can make your new kitchen and living space a much more sociable and comfortable place for gathering. Of course, you will need to check planning restrictions and fire regulations in advance of undertaking any structural works. Finally, don’t think a small kitchen is necessarily a bad thing. They require less furniture and fewer materials, so should cost less than bigger kitchens. Fewer surfaces mean less cleaning, too, and when it’s all finished, a well-planned design will ensure everything is where you need it when you need it, and within very easy reach.